If you are looking for professional moving services in North Hollywood, you are probably already swamped with choices in online search directories such as Yelp and Google. Good news is that you found us! Fastruck North Hollywood branch is a local moving company that is dedicated to provide service to the residents of the Valley. We provide fully equipped moving trucks, highly trained movers, equipment, and packing materials necessary to perform quality, safe and efficient relocation. Unlike many other companies that list themselves online as being located in North Hollywood, we are a true local company. 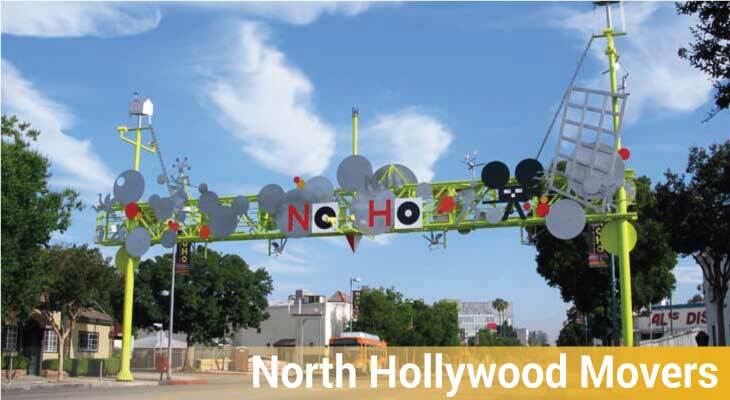 Whether you are moving into the NoHo Art District, or leaving the Toluca Lake, keep in mind that Fastruck Moving is ready to serve you! Our North Hollywood Moving Company is licensed by California Public Utilities Commission, and fully insured in accordance with Sate of California requirements. Don't overlook this important aspect when considering to hire movers to relocate you. Don't risk regretting your decisions after you hire rogue movers from Craigslist, or even off the street. We will gladly provide you a certificate of insurance as many buildings in North Hollywood area will not allow uninsured companies to enter their premises. Many of our North Hollywood movers are local, and thus are very familiar with roads and shortcuts. In addition we use latest GPS systems to help the drivers navigate around Valley area. Hire the local moving company that will not get stuck on Laurel Canyon traffic, but instead will take the Colfax Ave to save you on driving time. Moreover, if you are planning to hire movers to perform packing, unpacking, or simply labor only, our crews are always ready and minutes away. Please glance at our online profiles on Yelp and Google Local to find that we have 100% customer satisfaction scores. Don't wait call us now and save big time with Fastruck Moving!